Family gatherings . . . we all have them. They might be annual events such as family reunions or one-time occasions like birthday parties, weddings or funerals. These gatherings are events when our family members come together. As the genealogist or family historian, it is our job to gather information even if we have to drag it out of family members. 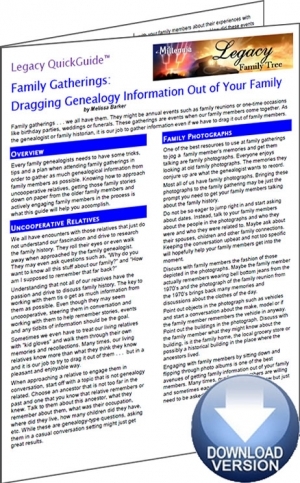 The Family Gatherings: Dragging Genealogy Information Out of Your Family Legacy QuickGuide™ contains useful information including the best ways to deal with uncooperative relatives, how to use home movies and family photographs and more. Also included are links to websites and resources covering ideas for family reunions including recording interviews, scanning photos and DNA testing. This handy 5-page PDF guide can be used on your computer or mobile device for anytime access.